Under closed glass in the vestry of All Saint's Church at Hollingbourne will be found an impressive 17th century needlework generally associated with the Culpepers. The vestry is normally locked and closed to the public, but a private showing can generally be arranged by placing an advance call to the Vicar. At the time Hasted wrote volume V of his 'History' his son was Vicar of Hollingbourne and may have had some evidence, which has now been lost. Sir John's second wife Judith was the daughter of Lady Elizabeth and Sir Thomas of Greenway Court and had three daughters. Since Hasted's time the daughters who supposedly did the needlework have become the daughters of Lady Elizabeth and they performed their work during the Commonwealth period by which time their number was considerably reduced. With a piece of needlework which consisted of cherubs and plant panels, most probably bought in London, it seems unlikely that the ladies of the house would tack the needlework to the velvet when they had skilled servants accustomed to such tasks. Altar Cloth or Funeral Pall? Was it an altar cloth? If so it was a very large one. In Charing Church there is preserved a communion table which is probably the one mentioned in the Churchwardens' Accounts as having been made in 1624 for 16 shillings. Less than six feet in length it would be lost under the Hollingbourne needlework. John Newman's 'North East and East Kent' suggests that it might be a funeral pall because of its size. The authorities at the Victoria and Albert Museum (who keep an eye on the condition of the needlework) have now accepted this theory. It is instructive to note that a document recording Baldwin Duppa's funeral at Hollingbourne Church in 1737 mentions 'covering the hearse with velvet' and 'a Large Velvet Pall with a Sarssnett over the body'. 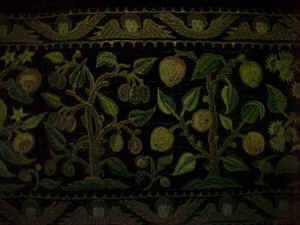 Although this needlework is reputed to have been made by the Culpeper ladies in the mid 17th century, the design and the use of applied work on velvet is typical of an earlier period and may have been influenced by the revival of ecclesiastical embroidery under Archbishop Laud (1573-1645), who re-introduced some of the richness into church decoration after a period of austerity. The purple velvet is of fine quality and possibly Italian, the interlining of coarse, light blue linen, and the backing a later replacement. 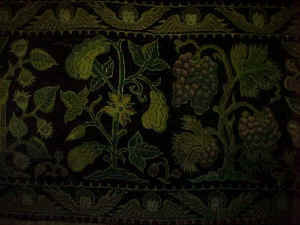 The embroidery is worked in silk and either silver-gilt or gold thread. The design is a deep triple border of cherubs enclosing plant slips with a narrow border of metal thread, couched with cream silk, and small triangular areas in red, green, blue, cream and brown at random. There are two designs of cherubs arranged alternatively, all worked in tent stitch, using silks, on fine linen and applied. From the very large number of cherubs and the various standards of workmanship, it is probable they were the work of many hands. During the seventeenth century, trained draftsmen produced designs, which were printed on to linen and worked by professional embroiderers who then sold them to customers. Similar cherubs to these can be found on ecclesiastic work elsewhere, and it is possible that the Culpeper ladies may have bought them already worked and just applied them. Between the cherubs small stars have been worked directly on to the velvet, probably in smooth silver purl but much of the metal has corroded leaving the silk core. The plant slips are all of the finest workmanship and much superior to the cherubs. They are sewn with great artistic skill either with realistic shading or in interesting patterns such as checkered or stripes. 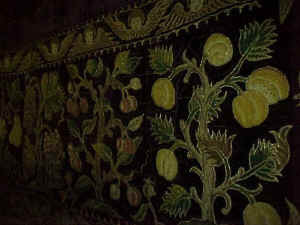 All are worked in tent stitch using silks except in two small places: the center of one pomegranate flower and the eye of one pear have been embellished with short lengths of metal thread, probably rough purl. The majority of the slips are recognizable species, probably taken from illustrations in an herbal, but there are a few flowers, not botanically correct, added to balance the design. Because of the originality of the plant slips they were probably hand drawn on to the linen, not printed. Source: The above text extracted from various church pamphlets.